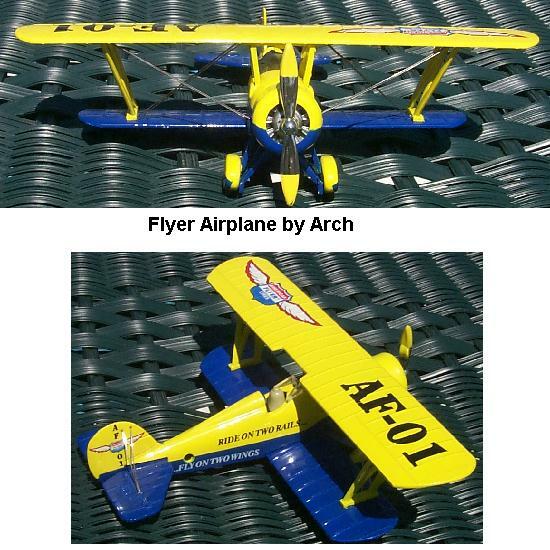 These models are all diecast metal and were officially decorated for American Flyer Trains. Truck 01: Here is a Red truck produced by Eastwood Automobilia and decorated for American Flyer Trains. 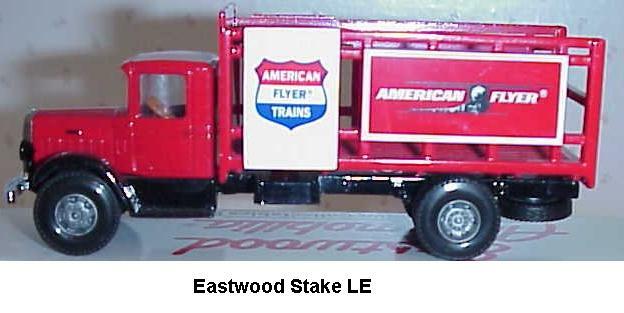 Truck 02: Here is another Red truck produced by Eastwood Automobilia and decorated for American Flyer Trains. It is scaled at 1/34. The bottom of the box identifies the manufacturer as 1st Gear. Truck 03: This truck was sold by Lionel Trains Inc (LTI) a few years back. The box alleges the scale is 1/64, but it might be a little large. Truck 04: This is another nominally 1/64th scale truck sold by Lionel Trains Inc (LTI) a few years back. Truck 05: Here is another Eastwood truck sold during calendar 1998. It too is supposed to be 1/64th scale. It is not too far off. Truck 06: Here is a Winross truck that appears to be 1/64th Scale. The rear doors open and the detail good. Airplane: This unusual Flying Truck was produced by Arch.